NEWEST High Tech Material Used! Just open a small bag or your briefcase and pull out a FULL size BROOM !! Works like other Appearing Poles collapsing method. 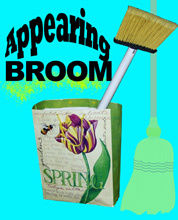 Broom is five feet tall Very Funny and Novel Prop!